Being the only public company in Hong Kong that is committed to the comic industry, we are pleased to announce two highlights: Our Dragon Tiger Gate series celebrates its 37th anniversary as it is still the longest-running comic publication in Asia. Additionally, on 22nd July 2011, Culturecom Holdings Limited has fully established Ucan.com as its subsidiary. Amid rapid change and diversification in the comic and entertainment industry, forecasting the future has become more challenging. We will respond to these changes through shifting towards a new set of values. By adjusting our beliefs and corporate structure, the action of Ucan will revitalise and enrich our content. Nowadays, comics are branching out into movie memorabilia’s due to recognisable heroes and archetypes. With roughly 200 titles (IP) on hand, we are looking towards using Ucan to digitise our comics to deliver outstanding visuals for our consumers. Ucan embraced Jay Chou to the corporate family, our newest substantial shareholder. Welcoming youthful and talented individuals into the Group is something which we have always corresponded to – allowing us to develop visionary goals for the future. Ucan is not all about revitalising our comic content. Ucan is a hub of creativity, comprised of three platforms: Cloud City, App City and Socialoke. Each platform is positioned on different devices but at the same time they are all intertwined and connected. Every user will find a source of their own entertainment in one of these platforms, whether it will be in gaming, shopping, virtual networking or even participating in our live vocal “SocialOke” online events. Adapting to the existing model of an MMORPG, this is all prepared through your avatar. Your avatar will be a replicate of your mind and body, but more importantly it will be a representation of the individual you aspire to be. With Augmented Reality being defined as the 8th Mass Medium, we can see an opening which will allow us to deliver a new exciting product – Social AR Gaming. A concept which has yet to mature but at the same time there is room for unimaginable growth. 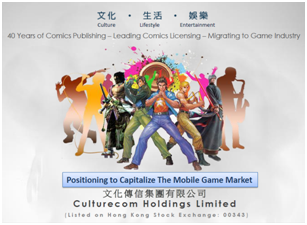 Culturecom with over 40 years of experience in the comics publishing industry and as a leading comic’s license company is now migrating to the interactive entertainment industry. Positioning to capitalize in this lucrative industry. Our upmost desire is represented through the hearts of our Executives and Employees as we will never cease to search for new ways and provide quality entertainment. Whilst continuing our pursuit in integrating technology with culture, we are confident Ucan will bring about incomparable creativity to our content and will fulfil the desires of each individual across the world.